Seedy Penpals – What a Brilliant Idea! I am joining in with this simple and life affirming Seedy Penpals Scheme – I have always sent a few seeds here and there and love the simplicity of this. I just wandered into the ‘cool room’ and surveyed the wreckage of the seeds that haven’t been sown this year and always regret and would love to share them, a mix of seeds I have saved, ones I have bought with great enthusiasm and so on. I don’t know if I can match up to all the ideals of the scheme but I think it’s a good starting point for anyone. Sadly we can’t do this with people outside the UK and EU but there’s nothing to stop you setting up your own Seedy Penpal scheme in other countries. I tried once sending seeds ‘out of bounds’ and they didn’t germinate for the person I sent them to, so I suspect it’s probably not worth doing, quite apart from the legal aspects of it. I also often end up with too many small seedlings for my tiny garden, and frantically give them away as I suspect most suburban gardeners do, but I don’t see as how I can send those through the post. I am sure many gardeners are in the same position. We should have local seedling swaps, a project for another growing season perhaps? Edit : You can read all about the scheme on Carl Legge’s site and on Mel’s Edible Things site and sign up. Carl is a fount of knowledge and kind support about all sorts of things, and his enthusiasm is a joy. Mel is new to me but I am editing this post as I realise this is a joint project from them both. Hi Mel, I am going to spend some time on your site very soon, it looks great! 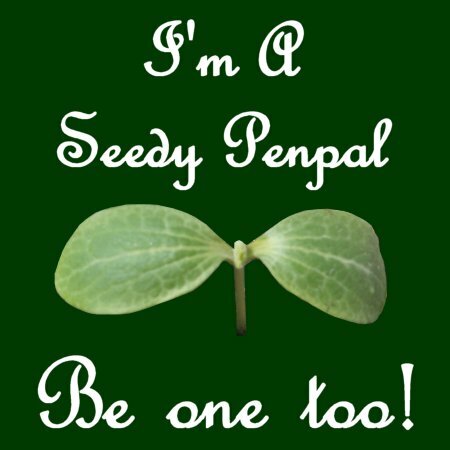 Seedy Penpals is a great way to share seeds with like-minded people. We all like to send and receive surprise treats: with Seedy Penpals you get to grow them too (and eat some). To read more Click Here and join up and who knows what you will be growing next year! Here are three things I have grown from seed this year. Some beautiful scented sweet peas and my attempt, yet again, at growing sweet peppers, this is the Lipstick variety and one of the tomato varieties I am trying. You don’t have to blog, or tweet or anything like that to join in, so what are you waiting for? It’s been a crazy year for growing stuff in the UK, we had a very cold dry spring and then loads of rain but something will always grow and well, isn’t that a good enough reason? I dunno. One final pic of the Lateh tomato, a variety bred in Moscow, Idaho and distributed here by the Real Seed Company. It has a reputation of being one of the earliest around and able to cope with cold short growing seasons. This is the first ripe tomato, grown outdoors this year, amazing! This entry was posted in Garden and tagged Carl Legge, great ideas, seedy penpals on 29/07/2012 by Joanna.